Create an account and transfer currencies using this referral link (you get a free transfer!). Register a BullionVault account (gold or silver) with this link. 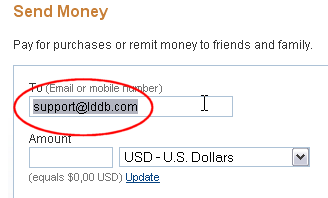 In order to make an efficient donation to LDDb (and avoid seeing 8% to 10% of your donation be eaten up by transaction fees), there is a way to initiate payment from your side and lower these costs to 0%.